He sent two eagles flying from the eastern and western extremities, and the path of the eagles crossed over Delphi where the omphalos, or navel of Gaia was found. Earlier myths include traditions that Pythia, or the Delphic oracle, already was the site of an important oracle in the pre-classical Greek world (as early as 1400 BC) and, rededicated, served as the major site during classical times for the worship of the god Apollo after he slew Python, "a dragon" who lived there and protected the navel of the Earth. "Python" (derived from the verb pythein, "to rot") is claimed by some to be the original name of the site in recognition of Python which Apollo defeated. The Homeric Hymn to Delphic Apollo recalled that the ancient name of this site had been Krisa. Others relate that it was named Pytho and that Pythia, the priestess serving as the oracle, was chosen from their ranks by a group of priestesses who officiated at the temple. Apollo\'s sacred precinct in Delphi was a panhellenic sanctuary, where every four years, starting in 586 BC athletes from all over the Greek world competed in the Pythian Games, one of the four panhellenic (or stephanitic) games, precursors of the Modern Olympics. The victors at Delphi were presented with a laurel crown (stephanos) which was ceremonially cut from a tree by a boy who re-enacted the slaying of the Python. Delphi was set apart from the other games sites because it hosted the mousikos agon, musical competitions. These Pythian Games rank second among the four stephanitic games chronologically and based on importance. These games, though, were different from the games at Olympia in that they were not of such vast importance to the city of Delphi as the games at Olympia were to the area surrounding Olympia. 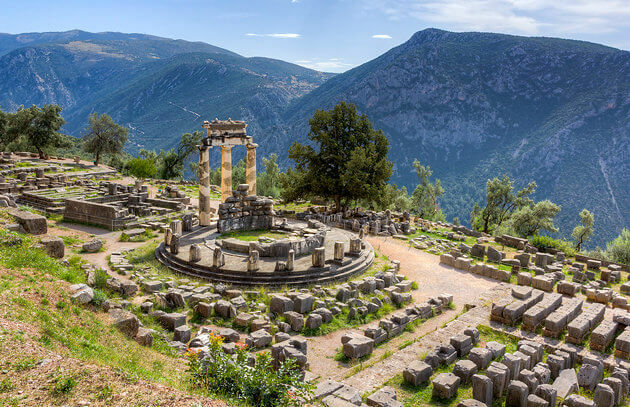 Delphi would have been a renowned city whether or not it hosted these games; it had other attractions that led to it being labeled the "omphalos" (navel) of the earth, in other words, the center of the world. Delphi was an important ancient Greek religious sanctuary sacred to the god Apollo. Located on Mt. Parnassus near the Gulf of Corinth, the sanctuary was home to the famous oracle of Apollo which gave cryptic predictions and guidance to both city-states and individuals. In addition, Delphi was also home to the panhellenic Pythian Games. The site was first settled in Mycenaean times in the late Bronze Age (1500-1100 BCE) but took on its religious significance from around 800 BCE. The original name of the sanctuary was Pytho after the snake which Apollo was believed to have killed there. Votive offerings at the site from this period include small clay statues (the earliest), bronze figurines, and richly decorated bronze tripods. Delphi was also considered the centre of the world, for in Greek mythology Zeus released two eagles, one to the east and another to the west, and Delphi was the point at which they met after encircling the world. This fact was represented by the omphalos (or navel), a dome-shaped stone which stood outside Apollo's temple and which also marked the spot where Apollo killed the Python. 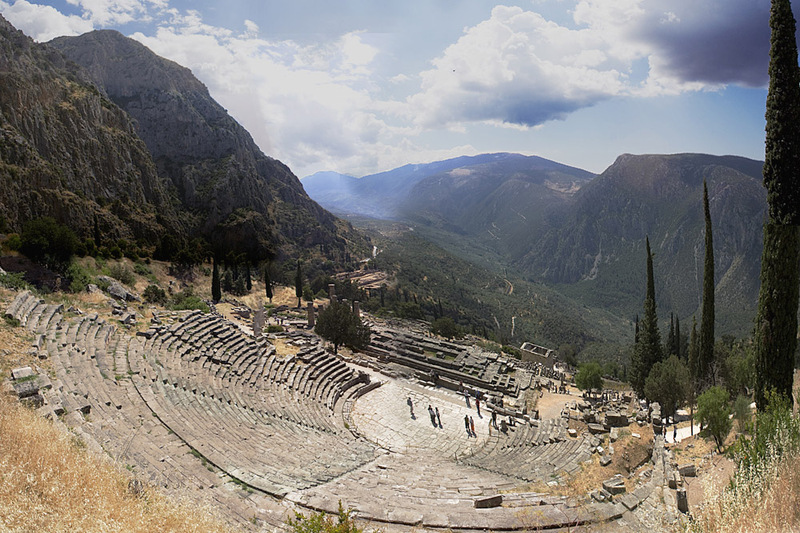 The oracle of Apollo at Delphi was famed throughout the Greek world and even beyond. The oracle - the Pythia or priestess - would answer questions put to her by visitors wishing to be guided in their future actions. The whole process was a lengthy one, usually taking up a whole day and only carried out on specific days of the year. First the priestess would perform various actions of purification such as washing in the nearby Castalian Spring, burning laurel leaves, and drinking holy water. Next an animal - usually a goat - was sacrificed. The party seeking advice would then offer a pelanos - a sort of pie - before being allowed into the inner temple where the priestess resided and gave her pronouncements, possibly in a drug or natural gas-induced state of ecstasy. Perhaps the most famous consultant of the Delphic oracle was Croesus, the fabulously rich King of Lydia who, faced with a war against the Persians, asked the oracle's advice. The oracle stated that if Croesus went to war then a great empire would surely fall. Reassured by this, the Lydian king took on the mighty Cyrus. However, the Lydians were routed at Sardis and it was the Lydian empire which fell, a lesson that the oracle could easily be misinterpreted by the unwise or over-confident. Delphi, as with the other major religious sites of Olympia, Nemea, and Isthmia, held games to honour various gods of the Greek religion. The Pythian Games of Delphi began sometime between 591 and 585 BCE and were initially held every eight years, with the only event being a musical competition where solo singers accompanied themselves on a kithara to sing a hymn to Apollo. Later, more musical contests and athletic events were added to the programme, and the games were held every four years with only the Olympic Games being more important. The principal prize for victors in the Games was a crown of laurel or bay leaves. The site and games were managed by the independent Delphic amphictiony - a council with representatives from various nearby city-states - which levied taxes, collected offerings, invested in construction programmes, and even organised military campaigns in the Four Sacred Wars, fought to redress sacrilegious acts against Apollo perpetrated by the states of Crisa, Phocis, and Amphissa. In 480 BCE the Persians attacked the sanctuary and in 279 BCE the sanctuary was again attacked, this time by the Gauls. It was during the 3rd century BCE that the site came under the control of the Aitolian League. In 191 BCE Delphi passed into Roman hands; however, the sanctuary and the games continued to be culturally important in Roman times, in particular under Hadrian. The decree by Theodosius in 393 CE to close all pagan sanctuaries resulted in Delphi's gradual decline. A Christian community dwelt at the site for several centuries until its final abandonment in the 7th century CE. The site was "re-discovered" with the first modern excavations being carried out in 1880 CE by a team of French archaeologists. Notable finds were splendid metope sculptures from the treasury of the Athenians (c. 490 BCE) and the Siphnians (c. 525 BCE) depicting scenes from Greek mythology. In addition, a bronze charioteer in the severe style (480-460 BCE), the marble Sphinx of the Naxians (c. 560 BCE), the twin marble archaic statues - the kouroi of Argos (c. 580 BCE) and the richly decorated omphalos stone (c. 330 BCE) - all survive as testimony to the cultural and artistic wealth that Delphi had once enjoyed.